Have you ever heard of gyro? Greek dish made of meat and usually served wrapped in a flatbread. 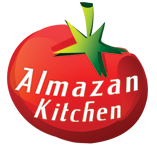 Today we represent you this awesome dish with a notch of AlmazanKitchen improvisation and passion! Fresh dough baked on coals, grilled free-range chicken with a special spice mix and refreshing tzatziki sauce… Recipe is down below! Take your mortar & pestle. Grind ½ tsp. of salt, coriander, caraway, pepper, handful of dried mint and 1 tsp. of oregano. Slice in major thin pieces 300g of chicken breast, spice it up well. Add ½ cup of pavlaka. Whisk it away. Unpeel, smash and chop until mushy consistency few garlic cloves. Add to the pavlaka then salt it. Grate 1 cucumber, add to the pavlaka. Mix well! Attenuate fresh yeast dough on the floured cutting board. Oil up and grill the dough on coals. Load the chicken into the grill basket. Grill until ready. Spread the tzatziki sauce on pita. Slice the chicken breasts and place it on sauce. Dress up with chopped fresh parsley. Finish off with ½ tbsp. of aged balsamico. Fold the pita and enjoy!